Although Thanksgiving is the quintessential American holiday, some of my American friends and I celebrate it here in London every year. A few years back, after cooking a turkey curry, I learned the hard way never to mess with the traditional roasted turkey, the star of the show. Since then my contribution is always to spice up the sides, quite literally. This year I’ve narrowed my focus to cranberries. There are only a handful of cranberry farms in the UK partly because they can only grow under very special conditions, like acidic peat soil and fresh running water which are more commonly found in the U.S. So when I see them in London supermarkets, I get very excited. My favorite thing to do with them, on the run up to our Thanksgiving dinner, is to turn them into a rich sticky chutney. A little sugar helps counter the extreme acidic sourness these fresh berries can have, while a few warming spices like cloves, black pepper and red chili add just enough heat and zing to perk up the turkey. Happily, this chutney is not just for Thanksgiving. It works really well in cheese sandwiches, and alongside ham and game meats. It can be prepared a few weeks in advance too, giving you more time to have a holiday on actual Thanksgiving. Recipe provided by Meera Sodha, who is an Indian foods expert and author of “Made in India: Recipes from an Indian family kitchen.” She lives in London. * Sterilize your jars by washing them in hot soapy water, then rinse them and let them dry in a cool (275 F) oven. Or use dishwasher-clean jars fresh from the machine. * Heat the oil in a large deep pan over a medium heat. When hot, add the mustard seeds and cinnamon stick. When the seeds pop, add the onion and cook for around 10 to 12 minutes or until the onion is translucent and turning golden. 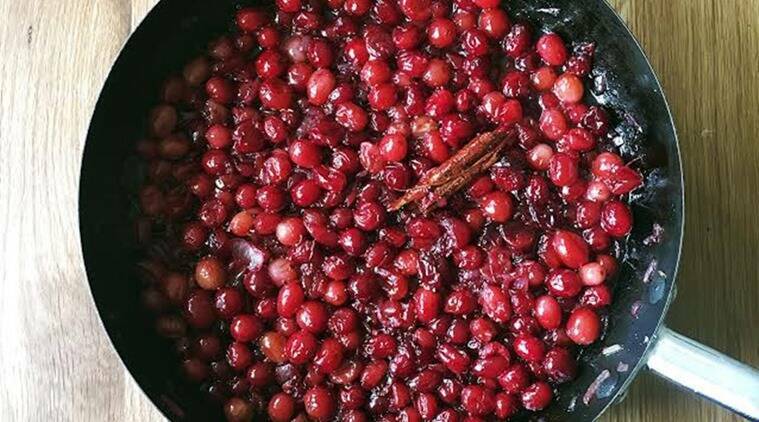 * Add the cranberries to the pan along with the sugar, lemon juice, white wine vinegar and follow with cloves, pepper, cumin, chili and salt. Stir and bring to a boil before leaving to simmer for around 20 minutes until the chutney thickens. * Bottle in sterilized jars and refrigerate. This chutney will keep for up to 3 weeks. * Nutrition information per serving: 54 calories; 16 calories from fat; 2 g fat (0 g saturated; 0 g trans fats); 0 mg cholesterol; 43 mg sodium; 10 g carbohydrate; 1 g fiber; 8 g sugar; 0 g protein.